Speaking to Ghanaians in the UK, President Mahama wondered why anyone would want to cause fear and panic in the forex market by predicting a GH₵10 to $1 fall in the value of the local currency. The President said: "...When you have politicians talking down the Cedi deliberately and saying that by the end of the year the Cedi will go to 10 point 1, why would you wish that? Why would you wish that for your own country? "And so it frightens people and everybody's little Cedis they have under the bed, they go and take it and go and buy Dollars and put it under the bed. Eventually the bubble will burst, and when it bursts you'll lose money, and that is exactly what has happened." 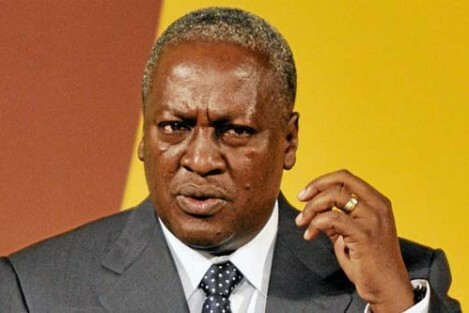 "Speculations on the Cedi was due to lack of faith, and it's coming back to haunt us", Mahama stressed. In August, Pastor Mensah Otabil of the International Central Gospel Church (ICCG) echoed fears expressed by a Yale Professor of Economics, Vikram Mansharamani, that the country's currency, could soon fall to as low as Gh¢10 to a Dollar. "That scenario of 10 to 1 is a possibility. It can. I don't wish it, I don't expect it, I don't pray for it", he said, but added nonetheless that Ghanaians should face the reality that: "Things could get worse," he said. The Cedi has fallen about 40 percent of against the Dollar in 2014. The currency has however stabilised after the infusion of $2.7billion into the economy through a $1billion Eurobond floatation and $1.7billion cocoa syndicated loan facility.